On a recent Sunday, the crunchy sound of ripped masking tape echoed off the walls at the Attleboro YMCA’s gymnasium. To the female athletes sitting on the sidelines, it was a cue to lace up their roller skates, secure their helmets and throw on an extra swipe of deodorant. They were in for an afternoon of full-contact drills meant to prepare them for the bloodthirsty bouts hosted by Providence Roller Derby (PRD). Most of the group accomplished this technical feat with graceful ease. But in the thick of the crowded pack, one pig-tailed player fumbled the sequence, resulting in a hard fall and cracked knee. A fellow skater with the moniker “Smashley Olsen” jumped up to help her off the track and nurse the fresh injury. The women later practiced how to take and deliver “hits” without getting knocked off their wheeled footwear. With approximately 60 players, it would be an understatement to say PRD is an active league. There are three local Rhode Island teams: Mob Squad, The Old Money Honeys and Sakonnet River Roller Rats. In addition, “travel teams” – specifically the Rhode Island Riveters, Killa Bees and Rocky Point Rollers — compete regionally. In mid-March, players drove up 95-North to go up against The Port Authority, the home team representing Portland, Maine. Games in New Hampshire, Washington, DC and upstate New York are scheduled through June. If not familiar, the rules of the game are complex. 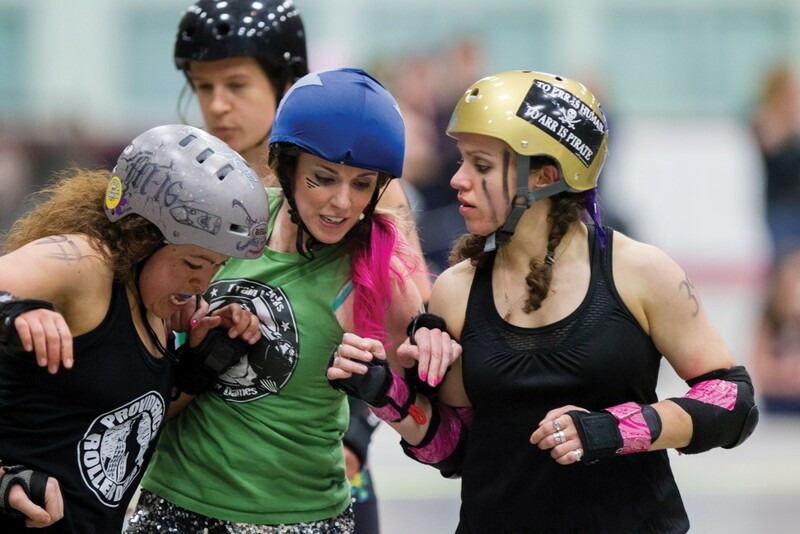 Regulated by the Women’s Flat Track Derby Association (WFTDA), the sport is played by two teams of five members moving in the same direction around a track. Plays consist of a series of short match-ups (called “jams”) in which both teams designate a jammer who scores points by lapping members of the opposing team. The teams attempt to block the opposing jammer while assisting their own jammer. For some newcomers, the intensive nature of the game can be more than a bit intimidating. But for veterans of the league, nothing compares to the rush of whizzing along the track. For instance, a player who goes by the alter ego Toni Montana grew up playing basketball and lacrosse. But as an adult, she found it harder to find social hobbies that offered the same level of physical intensity and comradery. After just one practice, she was hooked. As a third watch corrections officer, she often forgoes sleep to participate in practices and write press releases for the league’s website.